I participated in the Tour de Greenbelt for the second year in a row. Click here for my 2008 report. 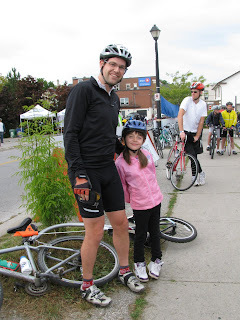 I did this ride with one of my daughters again this year which was fantastic. The bonding time I get from biking with them is tremendous, and seeing her so excited about cycling and being part of an event like this really excites me. Exercise and cycling is just a part of our lives, I hope it's a part of their as adults someday too. You can kind-of see our equipment laying at our feet... basically it's my hybrid and a trail-behind bike for Meghan, with its own handlebars and pedals. It's very cool! And she doesn't just coast, she pedals her heart out... a big help getting up hills! This year they've added longer options - 50k and 100k - to the 25k ride from last year. We did the 25k, but this time they attracted a more serious crowd with the longer distances. I could see myself doing the 100k in future years on my own. My only complaint - the route. It wasn't the best of the Greenbelt by any stretch, and included some very busy roads. At one point we even took to the sidewalk... I just didn't feel comfortable in the traffic with my daughter. The best thing was the start/finish at the Farmer's Market in Newmarket. Fantastic! The theme of the ride was fresh produce from the Greenbelt, and being able to buy a bunch of stuff after the ride was excellent. We stocked up on local strawberries, raspberries, broccoli, eggplant (despite Meghan's disagreement), brussle spouts... all right off the farm. Nice. A great time for both my daughter and I! Good to see you two had fun. I might have try this one next year. This sounds like a cool ride! I need to get a bike like yours so I can take my kids to this one.